Are you trying to get more sardines into the diet? They are so rich in Omega3’s! Pulling the top from the can and eating sardines with a fork will do if it’s just you, but the rest of the family? You’d better come up with some plans. 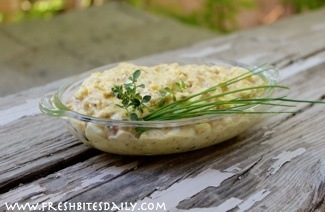 This quick and easy salad is even easier if you follow my suggestion of keeping some chopped and minced staples in the refrigerator. Hard boil 4 or 5 eggs while you chop. They keep a couple of weeks in the refrigerator and it is so much easier to do all that work at once. Toss this salad together in five minutes if you’ve taken care of the chopping in another campaign. 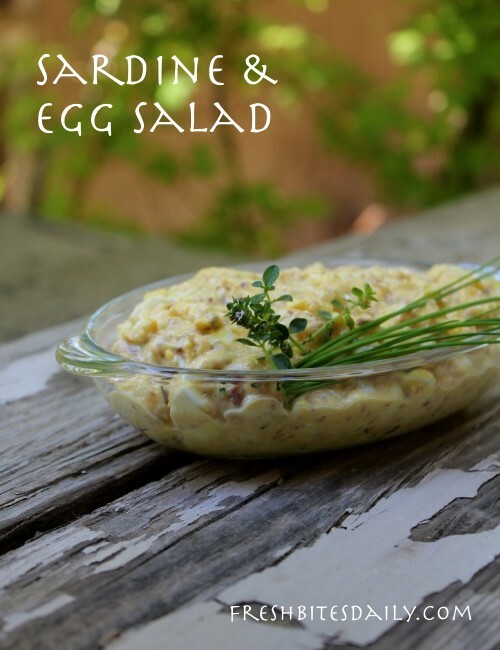 Once mixed, sardine/egg salad is really versatile. Pile it on a bed of dressed greens and garnish with fresh tomato and black olives. Use it as filling between two slices of fresh sourdough bread. Have it as a dip with chips. One winter afternoon when it was warm enough to sit on the deck, we celebrated by making a tray of crackers and sardines. Started with a large multi-grained cracker, then a slice of smoked gouda, a couple of arugula leaves, a pile of sardine/egg salad and a sprinkle of smoked paprika. What a sunny party that was! The tray was practically licked clean. Empty the sardine tin contents into a mixing bowl. Do not drain. That oil is carrying nutrients. Stir in the mayonnaise. You may like a bit more or less so it is a good idea always to add mayonnaise in increments to get just the right amount for your taste’s approval. Store leftovers in an air tight container in the refrigerator. Keep in mind that this is super travel food. Little or no mess! Keep the salad in one container and the crackers in another. All you need is a good herb tea to wash it down.